Highway 34 at Riverside Drive, where the new bikeway starts. 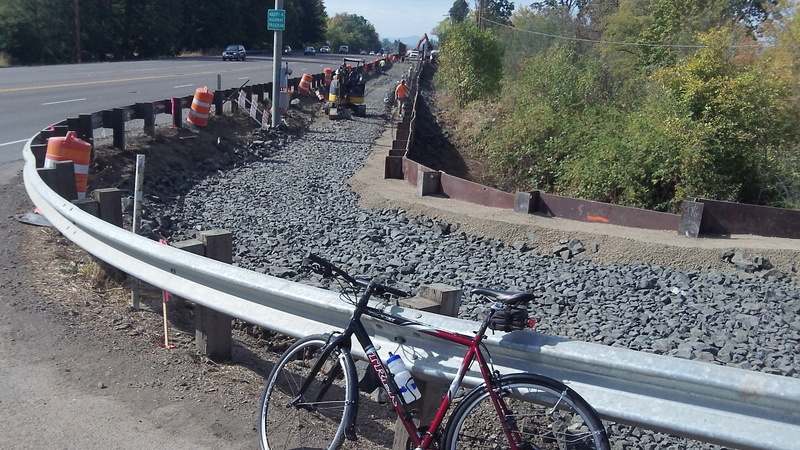 On Thursday I rode down Riverside Drive to check on progress on the bikeway being built along Highway 34. I was hoping it might be finished early, ahead of the Oct. 31 deadline. No such luck. But the wait won’t be too long. The two gaps in the asphalt that I saw in September are still unpaved. And on the steel bridge across Owl Creek, ODOT says the concrete deck has been poured but needs a couple of weeks to cure. Looking at the project Thursday, I got a better appreciation of the reasons for $1.1 million expense. Just west of Colorado Lake Drive, the bikeway has to cross the Owl Creek floodway before it spans the creek itself on its way west. On the downstream side of the path, the contractor has built a massive retaining wall, anchored with pilings every few feet. The whole thing looks strong enough to withstand a nuclear blast. I think we can be confident that the path won’t slide away even in a catastrophic 500-year flood. Looking west from Colorado Lake Drive toward the Owl Creek bridge. As I was admiring this part of the project, a guy in a hard hat walked up. 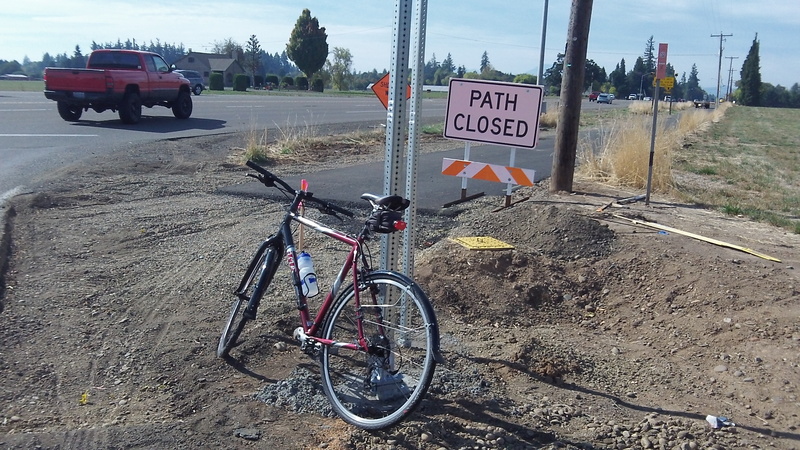 Before he got into an ODOT pickup, I asked him when the bikeway might be finished. He said it should be paved and open for use in two to three weeks. The bridge deck, of concrete, has been poured and is curing, ODOT says. You must be holding back on us… we have them everywhere else… where’s the bike pathway circle !? Hasso – drove by there today and was excited to see the progress. I have been waiting for this to be done for many years. 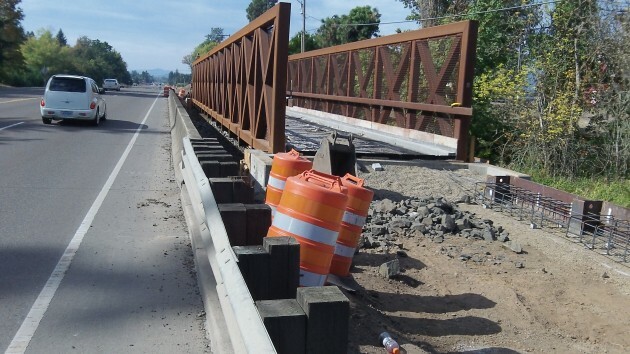 It would be great to get a group of riders together in a few weeks, when this is complete, and do a celebration ride to Corvallis and back along the path. If there is a way to put something like that together, let me know. I think it would be a good way to demonstrate cyclist’s appreciation for having this new path in place.